"41AN2-51, Unknown" by Timothy K. Perttula and Robert Z. Selden Jr.
DECORATION: The rim has engraved panels defined by brackets or hour glass-shaped hatched areas and one row (underneath the rim) of small triangular tick marks (the brackets are stylistically related to the Poynor Engraved, var. Hood rim panel). The body has two series of five concentric circular engraved lines with linear tick marks on the outer three of the circular lines. These circular engraved motifs are divided by a single near-vertical engraved line that ends in large engraved triangles. Patton Engraved, var. 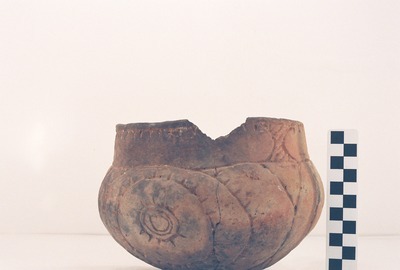 Freeman carinated bowl (Vessel 41AN2-51).